“Woman Does 6% of the Work but Gets 100% of the Credit”. That’s one of the first videos that pop up when you search for MIT scientist Katie Bouman on YouTube. Another leading video is titled, “Hi my name is Katie Bouman and I’m a fraud.” We can now capture on our screens a swirl of black nothingness trillions of kilometres away, but we still can’t manage to give a woman her due for the achievement. Now, Bouman was part of a team of more than 200 scientists across 60 institutes in 18 countries who cracked the black hole photo, but she accidentally became the face of the whole effort. 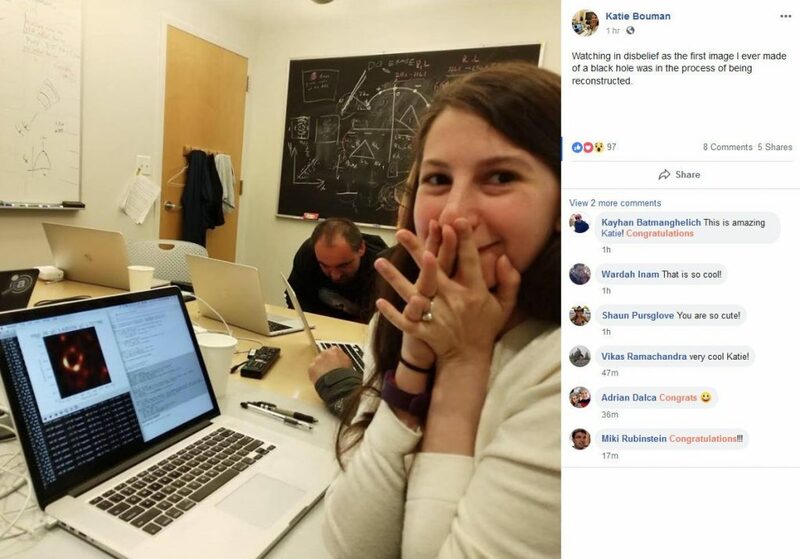 The media were glad to be able to put one person in the centre of the effort, and we got reports like “Meet Katie Bouman, One Woman Who Helped Make the World’s First Image of a Black Hole” and “Meet Katie Bouman, The Woman Whose Algorithm Helped Crack The First Image Of A Black Hole” and “Meet Katie Bouman, the woman who helped transformed our view of black holes forever”. She was even compared to MIT computer scientist Margaret Hamilton, whose code helped put a man on the moon with the Apollo missions. Which was perfectly fine, since the entire effort would never have succeeded without Bouman’s contributions. As one data analyst wrote, it was Bouman’s algorithm that “made the effort of collecting all that [telescopic] data worth it.” She spent five years refining her algorithm and then leading one of the teams to test the data. But in the last few days, the Internet has exploded with rage at this celebration of Bouman in a hyper-masculine field, and we’ve rapidly witnessed our sexist standards for achievers and who can get credit for what. Many have not been able to swallow that a woman might have led this kind of scientific achievement and have been hunting for a conspiracy theory, or worse. Trolls have repeatedly set up fake Twitter and Instagram accounts in Bouman’s name to malign her, uploaded YouTube videos with misinformation about her work, and spread vitriol about her and attacked her credibility. Someone flagged her Wikipedia page for deletion. Reddit is awash with threads like “The Katie Bouman Phenomena OR How Feminism Invents Inventors,” and “History Being Falsely Written IN Plain Sight to Fit A Narrative.” And in election-crazed India, one meme falsely and hilariously attributed Bouman thanking Narendra Modi and Mission Shakti for blowing away some pesky satellites that were hindering the black hole project. Of course, many just wanted to garland a man instead—they finally found one and fervently circulated pictures of one of Bouman’s colleagues, Andrew Chael, named as the primary developer for one of the algorithms that created the black hole image. One meme claimed Chael wrote “850,000 of the 900,000 lines of code that were written in the historic black-hole image algorithm!” One Reddit commented wrote, “Katie has been plastered everywhere as being responsible for the code but if this dude did pretty much all the work, seems kind of crappy he doesn’t get recognized.” Some even created fake accounts to propagate him on social media. The disingenuity rose to the point where Chael had to himself tweet defending Bouman’s immense work and denouncing those with a “sexist vendetta against Katie”, stating baldly that the team’s software “would never have worked without her contributions”. The sexism continues to be systemic: women in science are cited less than men, get published less in journals, get paid less, and face more sexual harassment. And this strange phenomenon of how people still can’t accept a woman being brainy, and especially brainier than the men around her, is not just restricted to the uninformed—it’s exhibited by many scientists themselves. In 2015, Nobel Prize-winning scientist Tim Hunt said “when they [women] are in the lab…you fall in love with them, they fall in love with you, and when you criticise them, they cry.” A Google engineer’s infamous 10-page letter on gender in 2017 claimed, among many unscientific ideas, that “women, on average, have more: Neuroticism (higher anxiety, lower stress tolerance).” And just last year, CERN physicist Alessandro Strumia argued in a lecture that women are not discriminated against in science, but rather they don’t like science or just don’t have the aptitude for it. Maybe singling Bouman out required more nuance from MIT, the media and everyone who rushed to congratulate her. Maybe every time we celebrate a team effort, we must acknowledge the whole team. But the black hole image also just wouldn’t have happened without Bouman, say the experts. So why can’t she be the human face of this effort rather than some titular male head? It’s time to accept a different model when we think of who is a ‘regular’ scientist out there working on, and often solving, complex problems of the world. The post Trolls and Sexists Prove that Katie Bouman Deserves To Be the Face of the Black Hole Team appeared first on The Ladies Finger.